On the weekend of January 26th, 2018, the Diversity Among Peers (DAP) club traveled to Camden, New Jersey with students and teachers for a retreat at the Romero Center. The retreat, dubbed “The Urban Challenge”, was a weekend-long service trip centered around the Catholic faith. Over the weekend, Delbarton students and teachers, along with students and teachers from a school in Massachusetts, participated in the retreat. Students were introduced to the center and the staff by Mr. Richard Nalen who then introduced the group to the city of Camden and its citizens. The group then shared a communal dinner as well as a communal cleanup followed by early curfew. Early the next morning, the group traveled to the only grocery store in Camden and each participant was only allowed $3 for food to last them 24 hours. Most money was spent on whatever was cheap such as bread, while other key foods for a healthy diet were neglected due to their high cost. The group then went to several locations across Camden and provided service to hundreds of Camden’s citizens. These locations included a food bank and a home for the elderly. That night, back at the Romero Center, students and teachers played a game of Monopoly with a twist. Each player drew an envelope with their occupation and their starting money. The game demonstrated the cycle of poverty and the difficulty of escaping the cycle. The next morning, the group served breakfast to a group of grateful citizens. Later, the Delbarton students and teachers traveled to Philadelphia for lunch. On Sunday, the group attended mass and took a bus tour of the city. By noon, the group was on the bus and headed back to Delbarton. In addition to attending the “Urban Challenge Retreat”, the DAP recently hosted a diversity workshop at Delbarton School. Beginning on Monday, April 23rd, the members of the DAP led “Many Voices”, a three day workshop to promote discussion among Delbarton students, as well as draw attention to various issues concerning society today. The first day began with a short icebreaker. Students attending the workshop were given note cards with the name of animals on them. They then closed their eyes, and attempted to find other students of the same animal specie by imitating the sound that their animal made. While the activity served to make the students feel more comfortable at the workshop, it also brought to light issues of minority groups–some students comprised the only part of their species, and felt isolated, while other species were comprised of numerous students, who felt safe. The icebreaker transitioned to the first activity of the workshop; students positioned themselves by boards around the room with different aspects of society around the room (sexual orientation, race, religion, etc). The students discussed the role of these modifiers in their own lives, as well as their connections to their identity in society. At the end of the first day, all students gathered to discuss a series of controversial topic pertaining to society today. In doing so, the DAP aimed increase the scope of understanding about those participating, as well as hear different viewpoints on a given issue. On the second day, the DAP focused on the creating constructive discussions between participants. The main activity involved students writing down a time where they were offended, annoyed, or made to feel uncomfortable, and then examined different solutions to the issues. “Spectrum” took up the majority of the second day of the workshop. Here, members of the DAP called out controversial or polarizing topics, and asked students to one side of the room or the other, depending on their opinion. In doing so, students could hear an opposing viewpoint on a given topic, and respectfully acknowledge and listen to the opposing side. The theme of the final day of “Many Voices” was the role of comedy in racial issue today. Before discussing the topic directly, students participated in an activity that established groups based on affinities or interests. After the activity, the DAP played several videos of comedians making jokes about their race, or other races. At the end of each clip, the students discussed and analyzed the clips, primarily focusing on the good and bad interpretations of the jokes made by comedians. In this way, students gained insight on how different cultural and ethnic groups may interpret a situation differently. 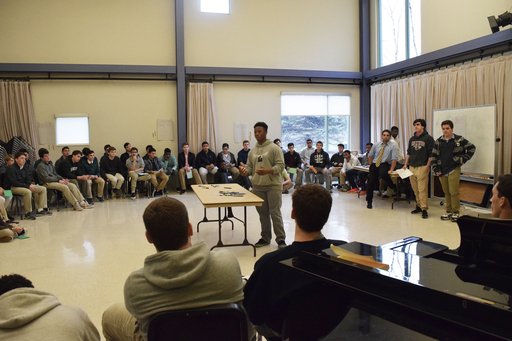 Overall, the DAP workshop “Many Voices” served to both bring the students of Delbarton closer together, as well as elicit insightful conversations among Delbarton students on topics impacting society today.